Whole Egg Solids are great for use in bakeries and are an economical way to incorporate eggs into your recipe without the threat of spoilage. Egg Solids have a fairly long shelf life when kept in a sealed package and stored in a cool area. Whole Egg Solids absorb moisture easily, making them a no hassle ingredient in any baked good recipe. Whole Egg Solids are great for use in bakeries and are an economical way to incorporate eggs into your recipe without the threat of spoilage. Egg Solids have a fairly long shelf life when kept in a sealed package and stored in a cool area. Whole Egg Solids absorb moisture easily, making them a no hassle ingredient in any baked good recipe. 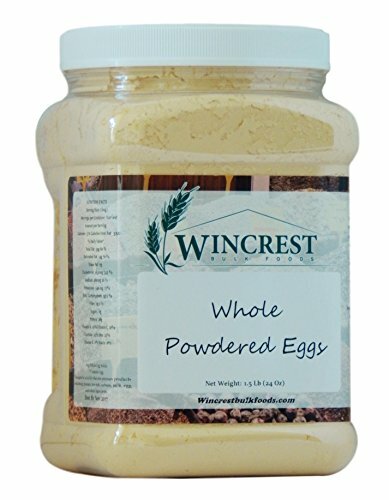 If you have any questions about this product by WinCrest BulkFoods, contact us by completing and submitting the form below. If you are looking for a specif part number, please include it with your message.